We were originally going to lump all unknown Fig varieties in one post, until such a time as they could positively be identified but have changed that thought. 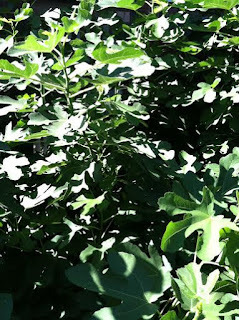 Instead we will write about them in various posts as we go. First let's see the Durbrow Unknown Fig. This variety is probably either Olympian or a strain of Brown Turkey such as LaRedek Eastern. 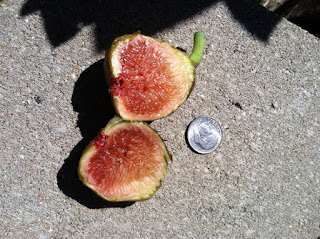 Either is a good choice variety for our area. 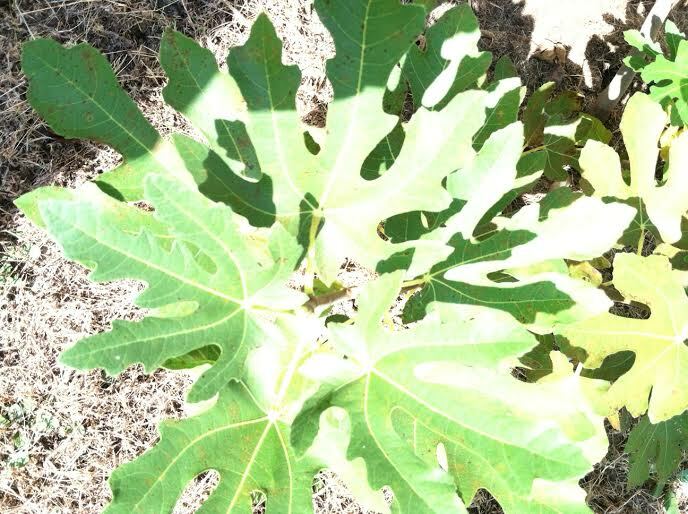 The dominant leaf pattern is nearly if not identical to Olympian but the figs more resemble the Eastern Brown Turkey except for the BT's nearly always have a hollow core inside the fig. 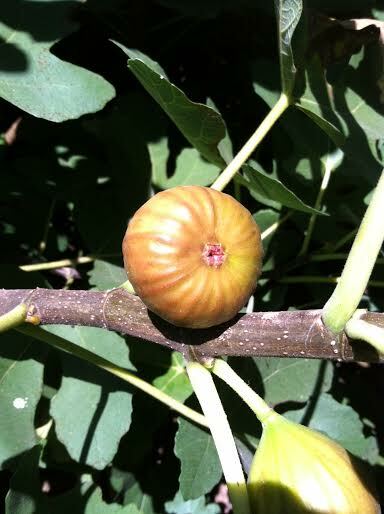 So for now this Fig remains as the Durbrow Unknown. This tree was purchased unmarked variety at a nursery, some 20-25 years ago by Mr. Durbrow and planted in a spot away from the home out in the yard. 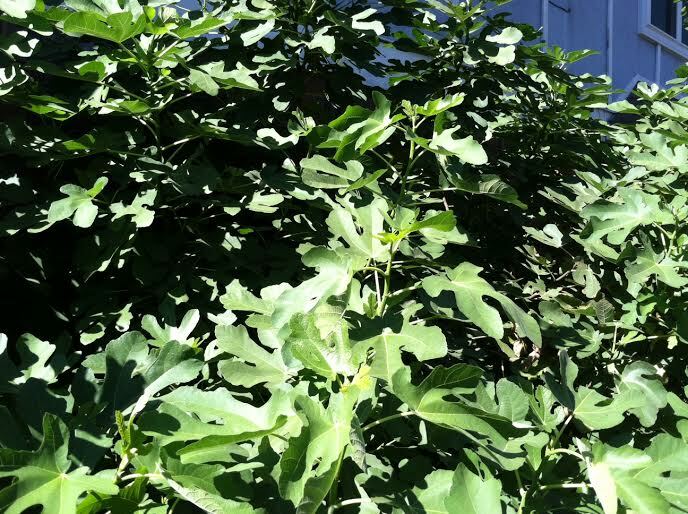 It didn't do so well out there so he moved it next to the Eastern facing wall of the home, near the South corner. 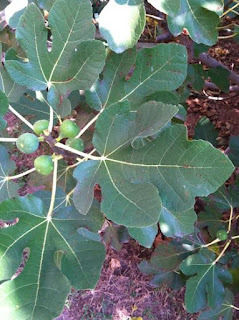 Fig trees have a habit of bushing if not trained to grow as a tree form. The lower limbs can become weighted and touch the ground, where they take root and spread if not pruned. 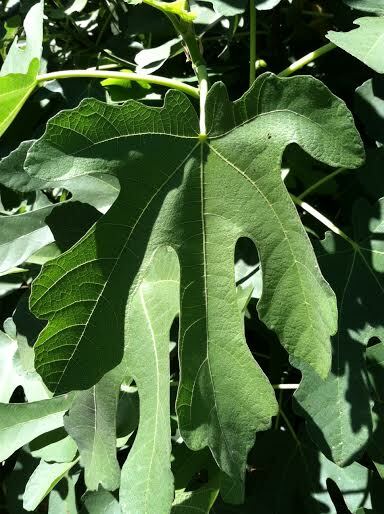 Such is the case with this tree which now has spread along approximately 30 feet Northward from its main trunk, along nearly the whole East side of the home. 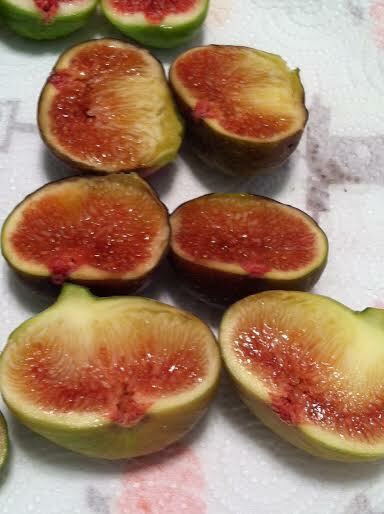 This fig is very sweet, one of the sweetest we've had and by all we could tell is completely seedless, very soft eating with a thin skin. Undoubtedly the largest bush form Fig we have personally witnessed. 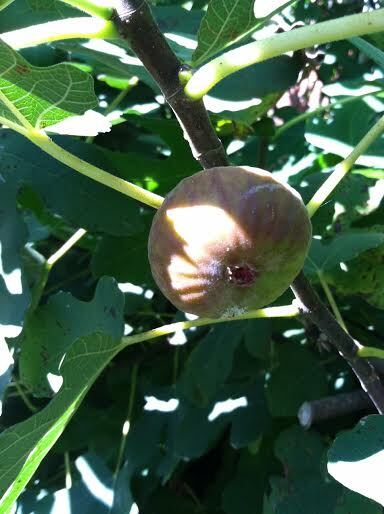 Late to ripen this year but Mr. Durbrow said it has ripened earlier in past years and probably all the rain we had earlier in the year caused a delay in fig formation. 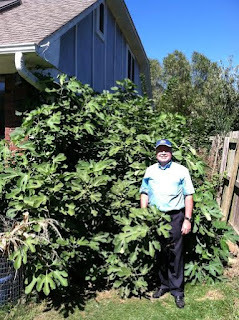 We're very much looking forward to helping Mr. Durbrow do the Fall pruning on this Fig! 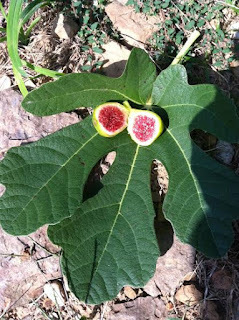 The next Figs come to us from Sister Madeline at St. Scholastica in Fort Smith. 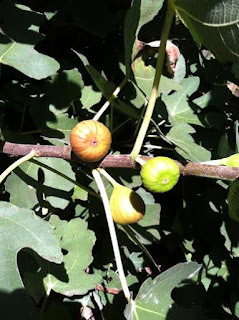 Our initial visit was very short and we have not yet had opportunity to get the full history on these figs but will update in the future as we have been given the honor of getting to prune their Fig trees after they go dormant in a few weeks. 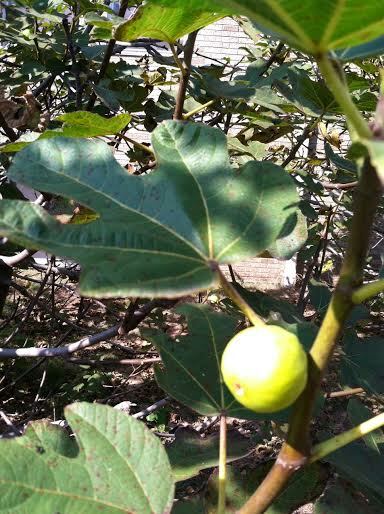 This first Fig is called their "Greek Fig" by Sister Madeline. 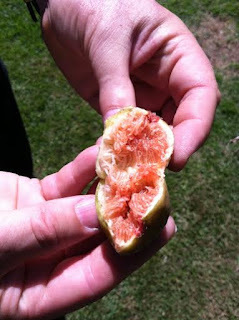 It's a green when ripe variety with a deep red interior. When it is perfectly ripe, that is when no white fig sap bleeds from the stem when picked, yet not wrinkled, this fig tastes like a very sweet, ripe strawberry. 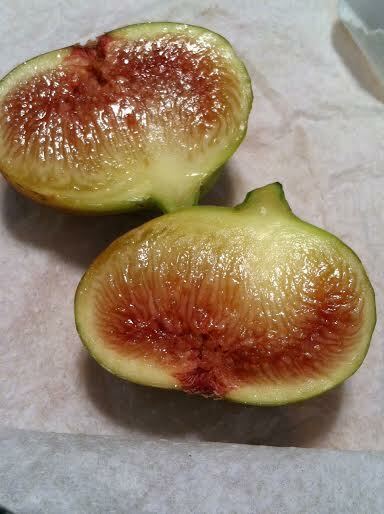 Simply delicious and ranks as one of the best tasting figs we've had. Sister Madeline. 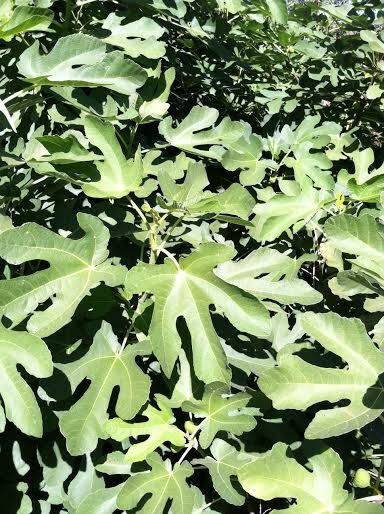 She's a tiny woman compared to this massive tree that resembles a bush form but in reality it isn't as typical a bush form as is common locally. 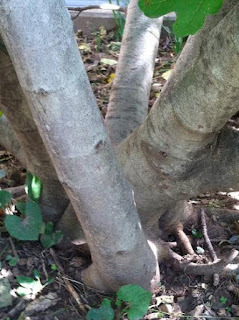 Four main trunks, the smallest being approximately 3.5 inches in diameter. 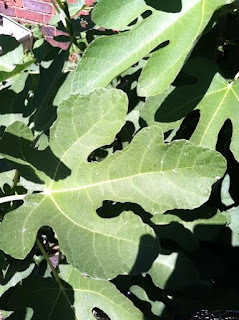 The leaf is very similar to our Unknown Lake Spur, which is very similar to the Greek Vasilika Sika. 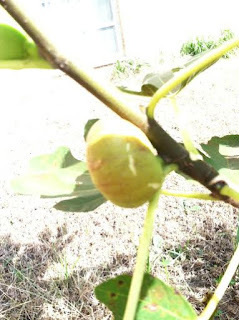 The next two photo's show their yellow "Italian Fig". 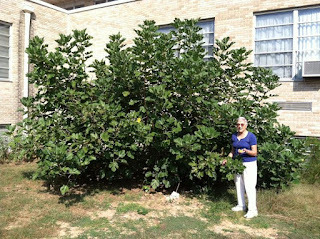 Sister Madeline says these two same trees of theirs make their largest figs. 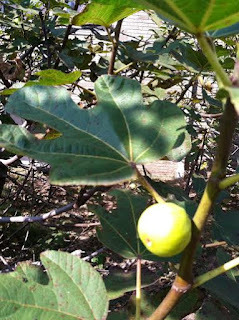 This was the only ripe one left on the tree, eaten on site and it would probably be classified in the "Honey Figs" group. Very sweet and tasty! 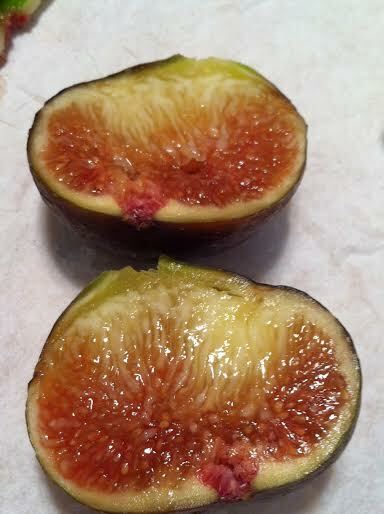 Their "Dark Fig". 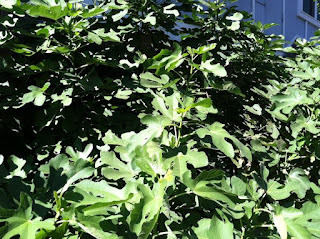 Likely Negronne, AKA Violette de Bordeaux. Delicious! 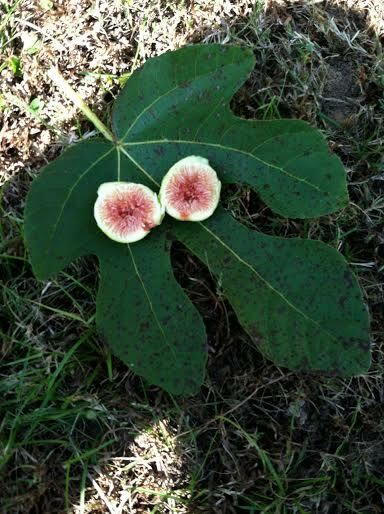 A true mystery Fig. Sister Madeline says this tree came up on its own. 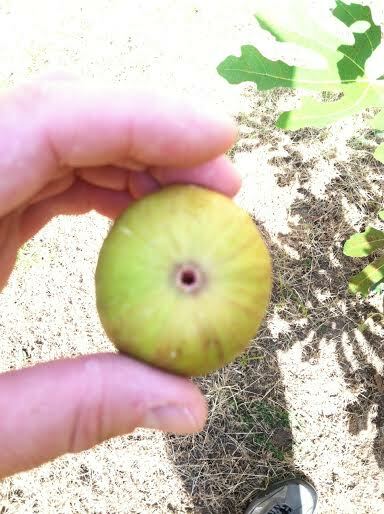 It's a good 20 - 30 feet away from the others. 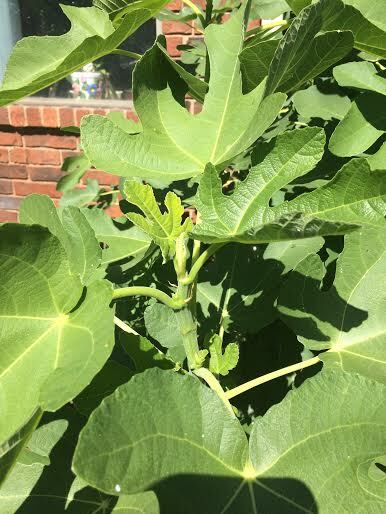 How can this be? We have no explanation. There are no male figs and no fig wasp for pollinating. This fig is different from any of the others. 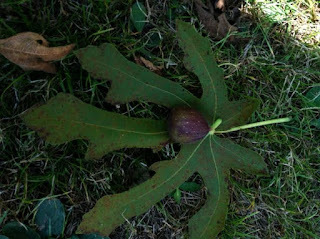 It has a Negronne style leaf but a large, flat bottom Fig that grows very close to the stem with no neck and a fairly large, open eye. 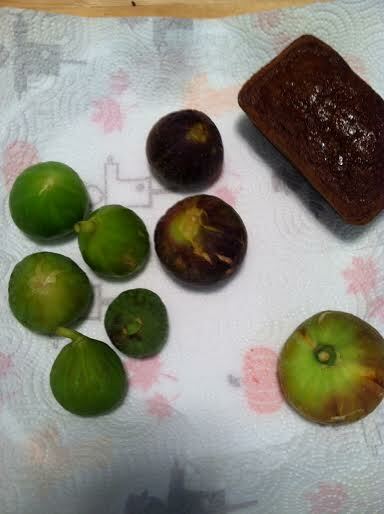 Figs and Fig Bread, a gift from Sister Madeline! 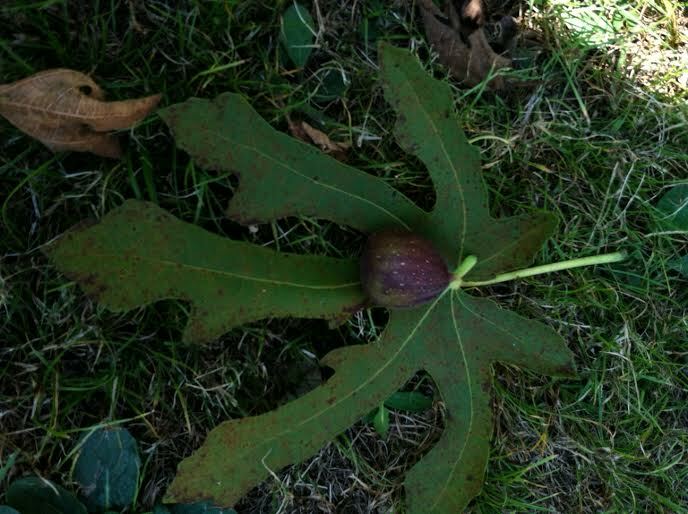 For size comparison since we didn't think to place a coin, the pumpkin print on the paper towel is the size of a quarter, so is the smallest fig. "Greeks" showing various stages of ripeness. 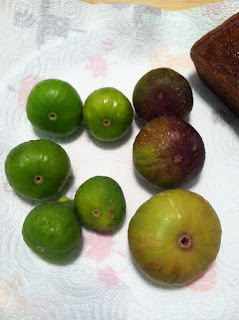 They were all very good but the ones like on bottom were to die for! The mystery fig. 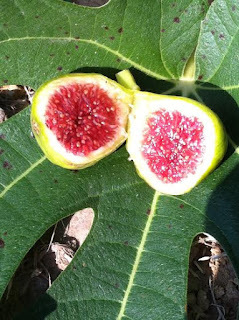 This fig has a flavor totally unlike any fig we've ever tasted. 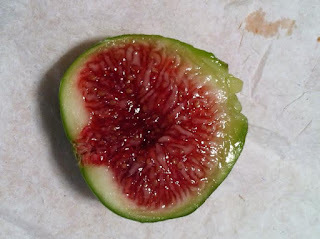 Nothing to compare it to other than to say it taste "Heavenly!" and the tree is very young and small compared to the others. 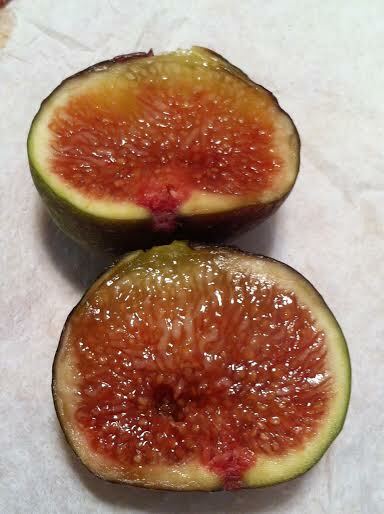 We simply have to propagate this Fig! 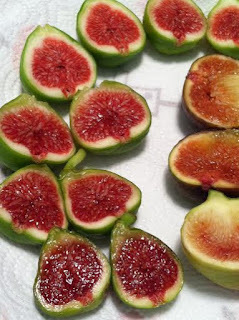 We hope you enjoyed these Figs. Check back around late November to see if we've been able to update as we learn more.